Airbnb is a big company. If you got in on that in the seed round you would have made a pretty nice return, right? Well, skipping on Airbnb happened a lot. I have friends that passed on the angel round laughing and saying “no ways, bro!”. The idea was just too stupid at the state that they were. It literally was air beds on floors. What you don’t see often are the emails from investors on the car crash that is missing out on a massive unicorn. In 2011, Paul Graham shared a series of Airbnb emails with Fred Wilson from USV effectively passing on Airbnb, despite the pleas of PG. It’s a fascinating read for historic reasons, with a number of insights into how venture capital investors think. I’m going to spell them out for you now and then share the Airbnb email sequence. First some words from Fred. When you walk into our conference room at Union Square Ventures, you see the box of cereal on the right on our conference room credenza next to a wifi router and a jar of Jolly Ranchers. It is there because we are big Obama fans? Nope. The cereal box is a reminder to back great entrepreneurs whenever they walk into our office regardless of what they pitch us on (as long as its in our investment universe). 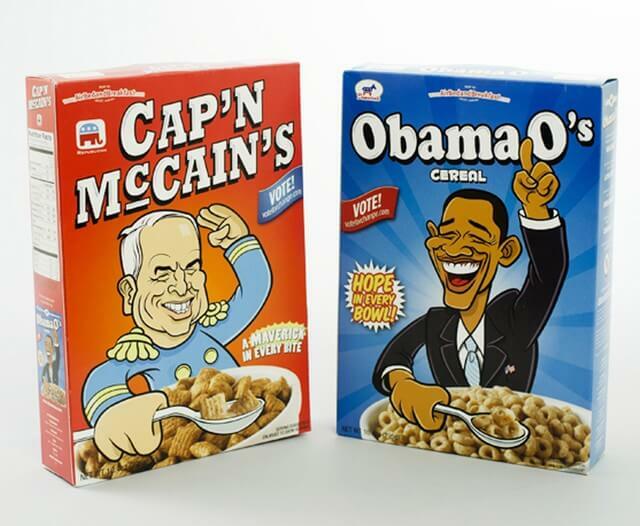 I am sure you have heard about the Obama Os and Cap’n McCains hack, right? Fred was impressed by this, but not enough to invest. The legacy of this is something that is memorialised every time founders show weakness. I asked them if they’d leave a box of the cereal for us and it has been sitting in our conference room ever since. 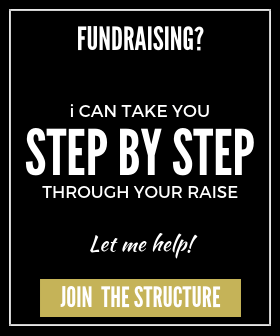 Whenever someone tells me that they can’t figure out how to raise the first $25,000 they need to get their company started I stand up, walk over to the cereal box, and tell this story. It is a story of pure unadulterated hustle. And I love it. So why did they pass? We couldn’t wrap our heads around air mattresses on the living room floors as the next hotel room and did not chase the deal. Others saw the amazing team that we saw, funded them, and the rest is history… We made the classic mistake that all investors make. We focused too much on what they were doing at the time and not enough on what they could do, would do, and did do… But we don’t always get it right. We missed Airbnb even though we loved the team. Big mistake. The cereal box will remain in our conference room as a warning not to make that mistake again. Here’s the thing though. The main reason investors pass on a deal is the team. They’ll never say that though like you’ll never walk out on a Tinder date in 30 seconds telling them they don’t look a thing like their photos. It’s rude. I’ve explained this in The real reason founders are not funded VCs don’t say in a pitch process. If you don’t know what an investible founding team looks like, I’ve written a presentation on Investible Founding Startup Teams. Whilst you don’t have to be Stanford CS grad to get funded, you need the personality. That’s something you have or not. 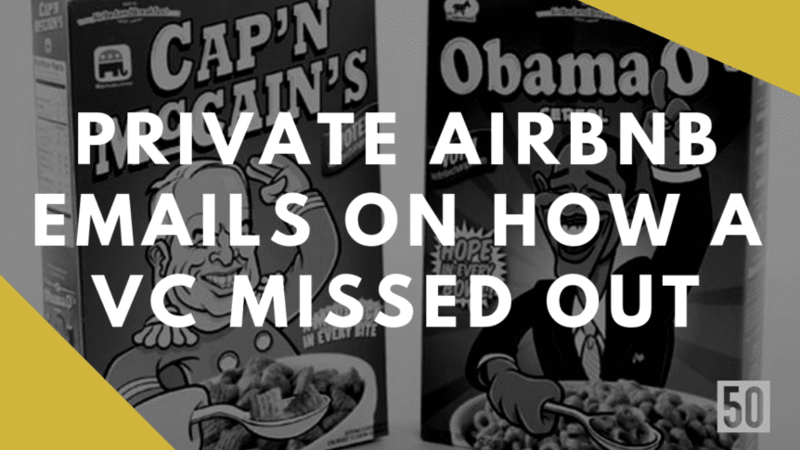 The Airbnb guys weren’t actually great on paper at all. They apparently are in hustle. Here are some of my observations that founders can pick up from the Airbnb email sequence, accompanied by the quotes. PG and FW both seemed to think the ultimate opportunity was getting into hotels. It wasn’t. It is also worth noting your idea is not special. So many people have had the same idea, but just don’t do something about it. It annoys me how many times people ask me dumb questions like ‘How can I protect my idea when pitching‘ on Quora. Execution matters. ‘Capital efficient’ is something that investors love. They give money to people for a living, that should be obvious. Airware, a drone company recently shut down after blowing $118m. TechCrunch attributes the quick descent on the company’s heedless spending policy. According to their source, “[AirWare] spared no expense ever.” I heard something similar from a hardware founder in Australia about Skully who also shut down (But are apparently alive again, for now). The market always wins. Always. It doesn’t matter if you are awesome if you have a small market. Investors can’t get a big exit in a small market. They are obsessed with it. It’s a critical pass/fail test. You want to top Everest, but you have to get to base camp first. Investors know this. If you really have a long term vision/plan, investors really do take it into account. I saw a video from a founder of Shoes of Prey and she said that they pitched their bespoke shoes business for women to male VCs. They didn’t get it. So what did they do? They sent a voucher to women on the team so they could get a pair. They timed it so it would be the same week they were pitching. The VCs could see how the women liked them and then ‘got it’. Oli Samwer didn’t get Birchbox. I was told he only ‘got it’ when his wife came home with a magazine. ‘Why did you buy that?’ he asked. ‘For the free lipstick‘. Then he got it and they started GlossyBox. VCs invest less frequently than you think. Maybe 1-3x a year. 99% are a no. If you think getting a fat check is going to be clear on your first meet, think again. It’s like sales. Most of your sales are going to come from perseverance in following up leads. Same with VCs. There is this concept of ‘dots form lines’. Over a number of interactions, VCs will see where you fit on a trust curve. market.) I’d recommend meeting them if your schedule allows. how they funded themselves with breakfast cereal. is the right one to do it. be bummed if he seems ambivalent. I’d recommend having the debate after meeting them instead of before. Are you still in NYC? on the ground in NYC hunting down (and understanding) their users. On top of several previous good signs. make an investor’s money go a long way. this a few years ago. one step further along it. to hotels, where is the point (in size of chain) at which it stops? in the gathering data phase.